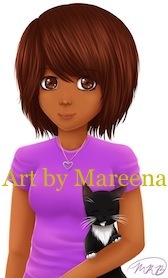 This self-portrait of the artist known as Mareena is a computer art generated anime girl with large eyes holding a black and white tuxedo cat. Mareena has brown cocoa colored skin, a pug nose, and gently curving lips. Her large brown anime eyes match her auburn highlighted hair. She wears a purple tee shirt; and a heart shaped charm hangs from a chain dangling from her neck. The black and white tuxedo cat, whose name is Skooter, presses her white paws against Mareena’s forearm as she sticks her head forward to see what’s going on. Skooter has soft white whiskers. Her fur looks quite elegant in this anime drawing of a cat.